As some of you know I have been planning to retrofit Night Vision Assistant to my Q7 4M. Its a £2000 option on factory order and as my car was sitting on the forecourt when I bought it I didn't really have a choice. Over the last couple of months I've been getting all the parts together and working out what needs to be done and I'm just about there. Parts have been sourced from ebay and my dealer (wiring etc). I reckon its going to take me a whole day if not 2 to install as there is quite a lot of work (certainly more than my TV Tuner retrofit I did a couple of months back) but I'd be chuffed if I can pull it off. One could argue its a waste of time but meh.. each to their own. Last edited by andyhud007; 02-11-2016 at 01:54 PM. All retrofits are possible if you have the time & money. I've fitted a 3GP system from a Q7 into my C6 A6, it's kind of a pointless & expensive install in some people eye's but makes me happy and I get google maps and a few other features that the C6 model was never designed to have. The most stupid retrofit I've seen is a dual-stage airbag on a single stage system, and the most impressive retrofit was a panoramic sunroof retrofit on an A3 which cost ££££ and a few weeks of work. The only things I would investigate before starting the installation are the can-gateway, central electrics & instrument cluster. You just need to make sure these support the night vision feature, you may be able to code them but when you connect everything up, these module may not have the software to support the function. 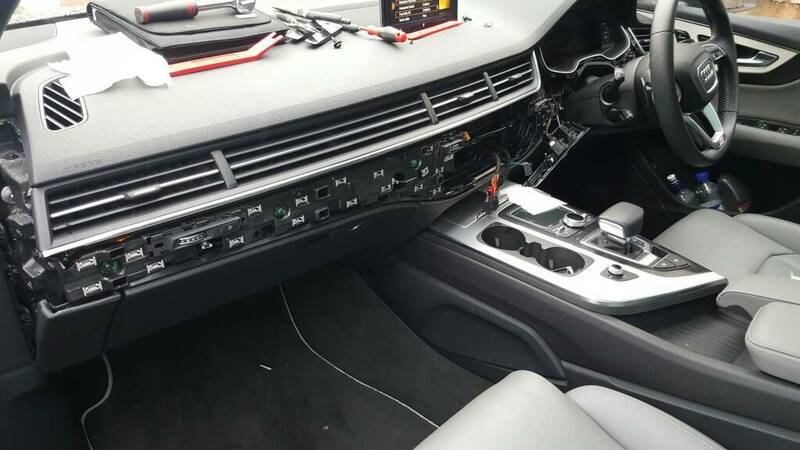 I've never understood why Audi don't have 1 module that support all of the functions, for example on the 4M Q7 there are 5 different can-gateway part numbers. Thanks B5NUT for your comments. Yes I have checked that stuff already. The other P/Ns for the CAN refer to Emergency Calling/SOS features. They are the only additional PR numbers bound to them. Looks like I have sussed all the coding out (not much as the NV Unit contains most) but it will need calibration once installed at a dealer. (as well as CP removal). Cheers though, will keep you posted. Don't trust etka, I've made that mistake over the last 10 years of retrofitting, if you look at them in etka they all have the same PR codes, also it lists a second gateway (item 2) which again all have the same PR codes. One of the ways to check would be to put the VIN number of a Q7 with NV into etka and see which gateway is selected. If you google the part number in google images you will see that they have different software versions etc, I had the same problems when I was installing the 3GP system into my A6, I had to find a Q7 can-gateway that supported 3GP and there is no PR coded for 3GP, so you had to go on a software version printed on the module. I can confirm the CAN Gateway is good for NV. NV Kit pieces collected from dealer this morning. Just waiting for the actual camera to arrive next week but I can make a start today at least. Wow that looks a huge job man. Was it worth it (as in have you tried it)? Full dash out or just what you've shown in that photo? Beastly job but you might be one of the first to retrofit it, no?